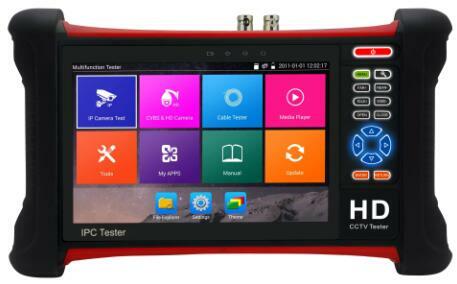 7 inch IP camera tester M-IPC-900A with analog, HDMI input, HDMI output, cable tracer app with toner wand, video level meter for analog camera. Cable tracer Cable tracer app with toner wand. Find out the connected cable in many messy cables. Connect one end of the cable to tester and the tester will send specific signals, which will enable the blue cable tracker to find out the other end of the connected cable quickly and easily by making clearly sound.